This has to be one of the most well rounded, most surprising films I’ve seen in a long time – I didn’t expect to feel so much for Short Term 12. Grace (Larson) is a 20 year old counsellor, helping troubled foster children heal the scars of their sometimes horrible pasts alongside her long-term boyfriend Mason (Gallagher Jr.) and their colleagues. However she has scars of her own that she has managed to push down all these years, until Jayden (Dever), a teenager living a similarly troubled life is brought in, bringing Grace’s demons back to the surface. 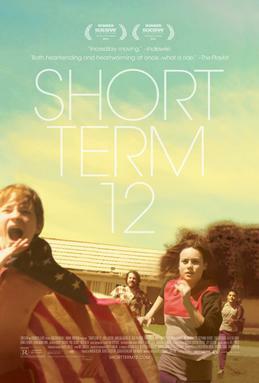 Someone told me it’s named ‘Short Term 12’ after the name of the care facility in the film (because children don’t usually stay for any longer than 12 months), but I’m not 100% sure if that’s correct or not. First of all, I don’t think I’ve ever seen a film that is so dark, yet have a consistently positive vibe about it. These kids are going through serious stuff, and they all break down and do something terrible during the film, but none of the negativity takes away from the underlying feeling of hope the film radiates. I think the music used is important to that as it is mostly positive, plus Grace is also a generally positive person throughout. This is the first film I’ve seen Brie Larson actually lead – I always joked about her being the support in every good teen movie (Scott Pilgrim, 21 Jump Street, The Spectacular Now etc.)! However I am pleased to say she did a good job taking the reigns in this one. She constantly gives off a positive vibe, showing herself to be the bright light in the darkness the kids trap themselves in. She is also able to effectively show herself having an internal breakdown, although I have seen other actresses show complex emotions better. However it comes as no surprise that it’s the kids that steal the show in this film – especially Kaitlyn Dever as Jayden, the problematic teen who opens up with Larson’s Grace. She shows a good range of emotions, from the cold, anti-establishment style teenager at the beginning to the scared child that she shows herself to be next to Grace. Praise also goes out to Keith Stanfield, who plays a quiet but scared teenager who is about to be reluctantly sent back to live with his mum. Like Dever, he shows a good range of emotions while keeping it all sheltered and distant from everyone. 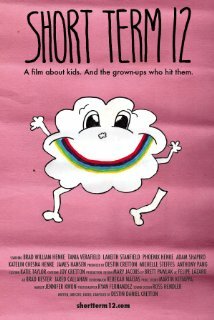 The poster for Destin Cretton’s 2008 short film. The directing by Destin Daniel Cretton is a complete mixed bag. There’s points, especially late in the film where he creates perfect moments, and I’m thinking to myself ‘wow, this could be a truly wonderful director’. But at a lot of points he looks like he has got top of the class at film school and translated that into an actual movie. Many of the shots look professional, but not very emotional – like he’s been told by a teacher to do that at this moment. The style of the film is very real, which for this film completely works, with an almost constantly shaking camera that could get irritating but is soon forgotten about. This is an incredibly good film, I’m surprised I hadn’t heard of it sooner! I guess it’s hard to sell something like this because it doesn’t really have a selling point, it’s just a plain story with a deeper, inspiring message that causes you to think long after the movie is done. I urge everyone to watch this, because it shows that everyone has problems that may not be easy to see from the outside. CONTRIBUTORS WANTED fancy writing for us?